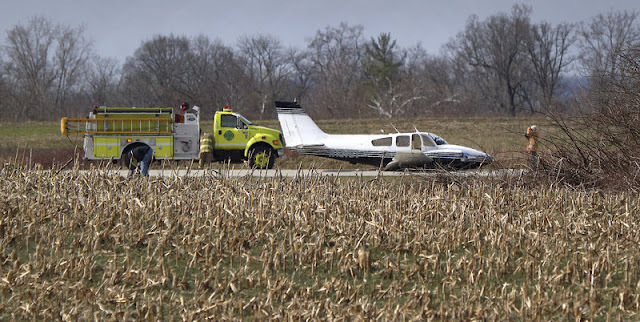 (BEDFORD) - Friday, March 30th an incident took place at the Virgil I. Grissom Municipal Airport that left the Beech 95-B55 (T42A) Baron significantly damaged. A door had come open while taking off and the pilot, David Ford of Bedford, circled around back to the airport to make an emergency landing, authorities said. Authorities said the pilot was unsure if the landing gear to the plane was down when he landed and it was not. The plane took significant damage to the under carriage. The Shawswick Fire Department was dispatched at 10:37 a.m. and arrived seven minutes after. The Bedford Fire Department arrived at the same time. When Ford was determined to be uninjured, the Bedford Fire Department left the scene. McIntyre Brothers Construction arrived at the scene with a crane to lift the plane on to its wheels and return the plane to the hangar. The Federal Aviation Administration (FAA) will be on scene today to conduct their investigation. The Indiana State Police, Lawrence County Sheriff's Department, Shawswick Fire Department and the Bedford Fire Department all assisted at the scene.